AnantaMandal attempts to capture Mumbai’s many colors. THE city of Mumbai has been a source of inspiration to make an artist over the British era buildings constructed in the ostentatious Gothic Revival style, streets that remain busy at all hours of the day, sea ports teeming with activity, a local train system that is the backbone of the city’s transport, and a number of slums- one of which is amongst the largest in asia offer an artist a variety of subjects to choose from. 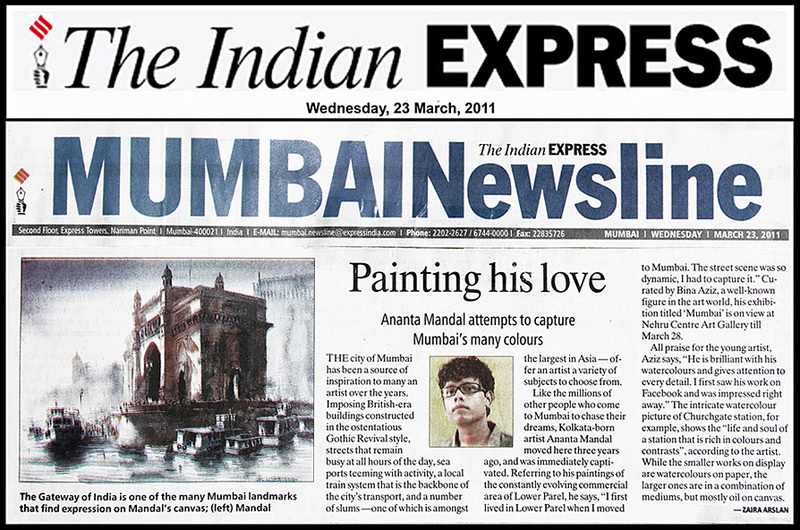 Like the millions of other people who come to Mumbai to chase their dream, Kolkata born artist AnantaMandal moved here three years ago and was immediately captured .reffering to his paintings of the constantly evolving commercial area of lower Parel, he says, “I first lived in Lower Parel when I moved to Mumbai, The street scene was so dynamic. I had to capture it. “curated by Bina Aziz, awell-known figure in the art world, his exhibition titled ‘Mumbai’ is on view at Neheru Centre Art Gallery till March 28. All praise for the young artist, Aziz says, “He is brilliant with his water color and gives attention to every detail I first saw his work on Facebook and was impressed right away. “the intricate watercolor picture of chuchgate statin that is rich in colors and contrasts”, according to the artist. While the smaller works on display are watercolors on paper, the larger ones are in a combination of mediums, but mostly oil on canvas.